Glycol feed applications come in all shapes and sizes. Unfortunately, until now glycol feed systems did not. 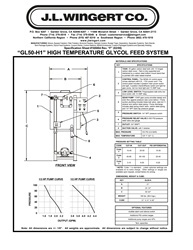 With three standard models and a long list of custom options, Wingert heavy-duty, automated Glycol Feed Systems deliver a comprehensive package of operational features that meet the specific requirements of virtually any closed loop system. Manufactured to exacting standards, Wingert Glycol Feed Systems offer the flexibility of various pressure ranges, motor sizes, instrumentation and much more. 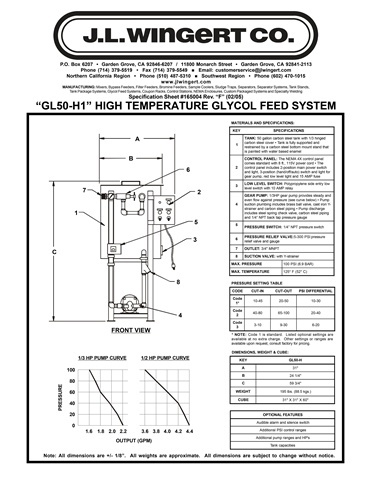 Regardless of the application, there is a Wingert Glycol Feed System to do the job. 31" X 31" X 60"